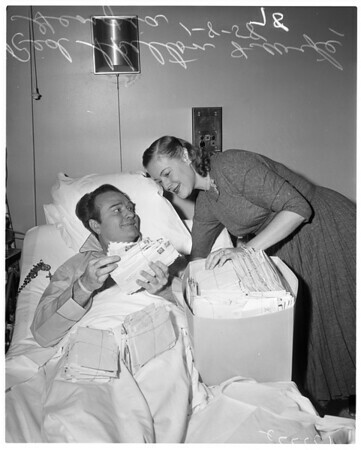 Red Skelton (at hospital), 1958. Caption slip reads: "Photographer: Gaze. Date: 1958-01-08. Reporter: Thackery. Assignment: Red Skelton. #61: Skelton portrays glumness he felt when first in hospital. Wife, Georgia with him. #62: Skelton shows happiness at rapid recovery and receipt [sic] some 10,000 letters. Georgia, wife, with him. #29-30-52-53-77-78: Red Skelton & wife Georgia".